There are many options for travel to our Exumas private resort. Scheduled flights, as well as private chartered flights are available direct from Ft. Lauderdale, Florida (1h 30 minutes) or Nassau, Bahamas (40 minutes) into Staniel Cay Airstrip. Once on the ground at Staniel Cay airstrip (a mere 1.25 miles from Fowl Cay), a member of our resort team will meet you personally, take care of your luggage and bring you to the dock, where you will be transferred by a breathtaking 7 minute boat ride to the Cay. Airport transfers for guests arriving from Staniel Cay airstrip to Fowl Cay Resort are complimentary. 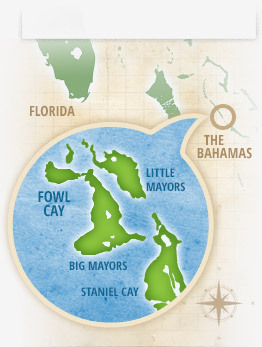 You are also welcome to travel to Fowl Cay with your own boat. Private planes may land at Staniel Cay's 3,030 ft. paved airstrip. You may also charter a sea plane near out resort. We are a VERY small island with a lean, hardworking and dedicated staff. Preparing our private resort for your arrival and those that follow is a tremendous challenge with limited time, so our check in/out times are VERY firm. Thank you for your understanding. Step 1: Fly to Nassau, Bahamas or Ft. Lauderdale, Florida. Step 3: The Fowl Cay boat will pick you up at Staniel Cay for the short 7 minutes boat ride back to the island. Step 1: From NAS plot trip from Porgee Rocks across Yellow Bank to the Exuma Chain. Step 2: Follow Exuma Chain down to Fowl Cay (24'11"N, 76'28"W) but leave enough time to drop anchor at Shroud Cay for a picnic and swim. Step 3: Bring your boat to our north dock, tie off and let us help you off load your luggage and welcome you for your stay on Fowl Cay. Prices quoted are as of Jan 2019 and are subject to change and availability. Please confirm all pricing with each company individually. A passport is necessary for all U.S. citizens entering the Bahamas. Fowl Cay is also accessible by private boat or private plane via a 3030 ft paved airstrip at Staniel Cay. Please contact us for more information on these alternate ways of reaching us.